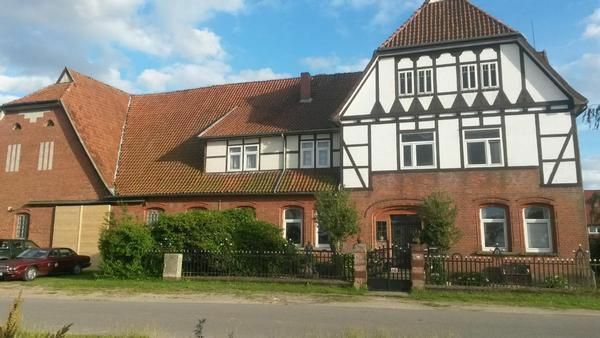 Our apartment is located in the heart of the Lüneburg Heath and near the Hanseatic city of Uelzen. The farm Loosen is a mixture of ark and chivalry, a beet castle. The house is nostalgically beautiful with Baroque-book room, knight's room and other miraculous things in the house and yard. You live in the side wing of the large half-timbered main house with a view of the farm life. Very cozy with woodburning stove and antique and modern furniture. The apartment is fully equipped. You will find everything necessary for a holiday on our farm. Of course you have towels and bed linen (initial supply) for the stay free of charge. One bedroom with double bed, one bedroom with two single beds. Children up to 3 years sleep in our parents' bedroom free of charge. A cot is available on request. The living / dining kitchen is fully equipped. A small but nice bathroom with light shower and hair dryer. The apartment is suitable for a short break, as for longer stay. For an additional charge use of the wellness area in the rustic "piglet stable". The sauna with natural infusion, whirlpool, covered outdoor pool, massage mat, relaxation area, solarium, a cozy cafe / drinks lounge with armchair and bar stool. Towels, bathrobe, bathing shoes and mineral water in the wellness area for free. The use is at your own risk and liability. Do you know green eggs or goat cheese, you experience nature and animals up close and without additives. Our natural garden with pond and biotope, our barefoot garden or the large lawn with children's playground, pool, children's bathing area and fairytale garden invite you to linger, dream and play. If you want to keep fit, we look forward to helping you with feeding or crap. You want to experience pure nature, then go with our nature & wildlife educator on experience and tracking in the forest. You feel like cosiness, peace and child-friendly environment, you are exactly right with us. For children we offer all-day care and extra accommodation in a horse-drawn carriage. These excursion destinations can be reached in a short time: Hundertwasser station Hanseatic city of Uelzen, Therme Bad Bevensen, Heidepark Soltau, Serengeti Park Hodenhagen, Hanseatic city of Lüneburg, Bad Bodenteich, Otternzentrum Hankensbüttel, Oldenstedter See, Medingen, Holdenstedt, reservoir Stöcken u. V. M.
Towels: to rent once per person for 12 EUR (optional). Fuel fireplace: per object and day costs of 5 EUR (optional). Sauna: per object and day costs in the amount of 25 EUR (optional). Our place is a small village about 500 inhabitants. Very nice location in the middle of Wipperau. Towels (once per person, available 12 EUR). Pet (per object and day, included in the price 10 EUR). Firewood (per object and day, included in the price 5 EUR). Sauna (per object and day, included in the price 25 EUR).